To facilitate Foreign Direct Investment (FDI), Sri Lanka is launching this week an innovative online one-stop shop to help investors obtain all official approvals. To mark the occasion, this blog series explores different aspects of FDI in Sri Lanka. Part 2 will explore how the country can attract more FDI. Part 3 will relate how the World Bank is helping to create an enabling environment for FDI in Sri Lanka. You may have heard that Sri Lanka is intent on drumming up more foreign direct investments up to US $5 billion by 2020. At the same time, the government aims to improve the lives of Sri Lanka’s citizens by generating one million new and better jobs. This isn’t a pipe dream. Thanks to its many advantages like a rich natural resource base, its strategic geographic position, highly literate workforce and fascinating culture, the island nation is ripe for investment in sectors such as tourism, logistics, information technology-enabled services, and high-value-added food processing and apparel. What is FDI and why does Sri Lanka need it? 1. FDI and domestic investment are at the heart of economic growth. FDI could help accelerate Sri Lanka’s arrival at upper middle-income country status. Annual real GDP per capita growth averaged a bit above 4% in Sri Lanka over the past 3 decades. Accelerating this to 6% would speed up reaching upper-middle-income status – imagine reaching Singapore standards of living roughly a generation early. To get there, higher investment is needed. In many developing countries, FDI has overtaken aid, remittances, and portfolio investment as the largest source of external finance. In 2017, public sector investment in Sri Lanka was at an all-time high. 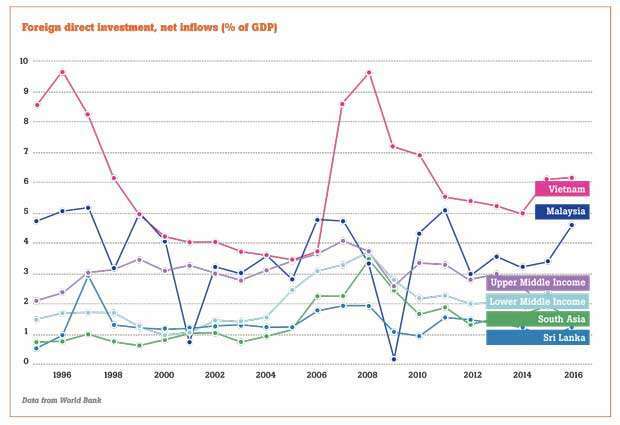 However, Sri Lanka’s public investment is still low when compared to its peers. The island’s fiscal budget is rigid with almost 60 percent of the expenditure being pre-determined. Public investment is low and private investment needs to take up its share of the burden. FDI and private investment from domestic sources can help accelerate growth and create jobs. FDI can enable the introduction of new technologies and innovative ways of production and service provision, which can then be replicated by local firms increasing their productivity and competitiveness and plugging them into domestic and global value chains. Particularly useful could be establishing innovation partnerships between firms in developing countries who have much in common and can easily transfer production and managerial strategies that are relevant to their country context. Boosting exports can help with the trade balance - Sri Lanka has had a persistent problem with its trade deficit. In addition, FDI here has largely been concentrated in traditional sectors with the composition of Sri Lanka’s basket of exported goods remaining largely unchanged for around 25 years. Greater FDI would enhance the access of Sri Lanka’s producers to global production networks and facilitate the development of new activities within existing value chains, thereby increasing added value in production and accelerating economic growth. It would also diversify the economy’s composition as new sectors are introduced alongside traditional sectors, making Sri Lanka more resilient to external shocks. FDI also helps governments boost tax revenues, providing the space for reduced borrowing — Sri Lanka’s borrowing is high — or for further budget spending on social benefits such as health and education. Since FDI comes in foreign-denominated currency, it is always useful in a country with external borrowing. 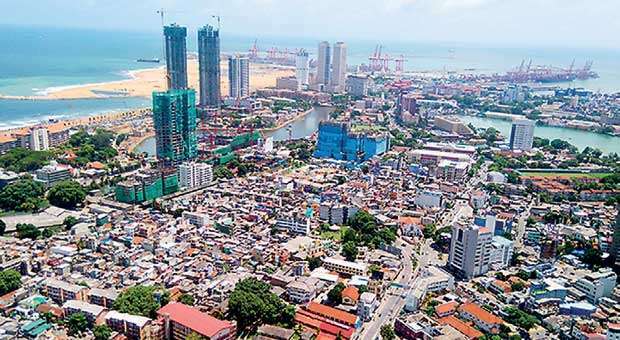 For now, FDI into Sri Lanka has been lower than in peer countries despite its location and access to major markets - hovering at less than 2 percent of GDP, as compared with Malaysia and Vietnam, for example.